I really love pizza, but not really the plain kind and especially not greasy ones like pizza with four kinds of cheese. I always eat vegetarian pizza. 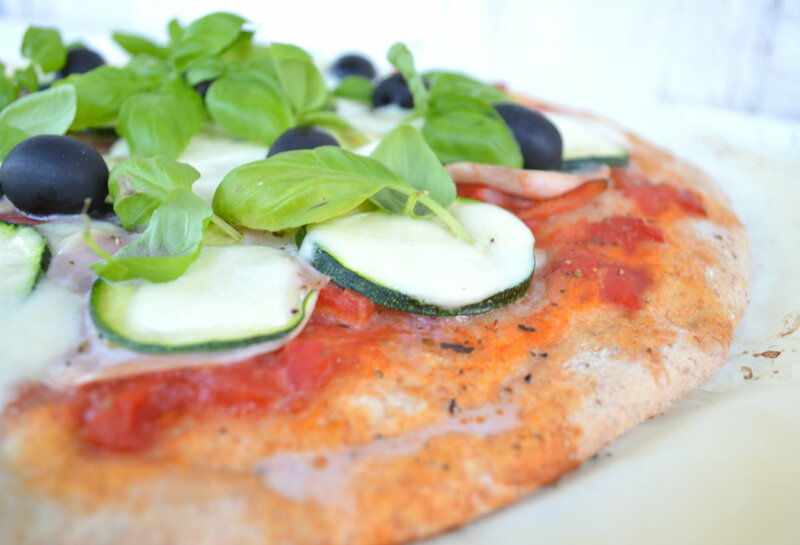 I also dscovered pizza with a dough that contains no yeast – these are becoming increasingly popular because they are light and crispy. Also, I love to freshen up a pizza with raw vegetables or a green salad. But I rarely bake it at home – and when I do, then it must be to my taste, light and fresh. I have this recipe for a nice, whole wheat dough pizza which has a healthier taste and composition. What you put on top is really your choice, and here is one version that I really like. Mix all ingredients in a bowl and knead in a mixer or with your hands until you have a firm dough. Cover with a cloth and let rise until doubled (about 30-45 minutes). On a well floured surface knead the dough once again and roll it out to the thickness of 3-5 mm in the form you want. Transfer the dough to a tin lined with parchment paper and spread one tablespoon of olive oil on it. Cover with a cloth and let stand for 15 minutes, during which time preheat the oven to 220 ° C.
Cut the zucchini into thin slices (about 2 mm), season with salt and after 10 min drain the excess fluid. Spread the tomatoes on the dough. Sprinkle with oregano. 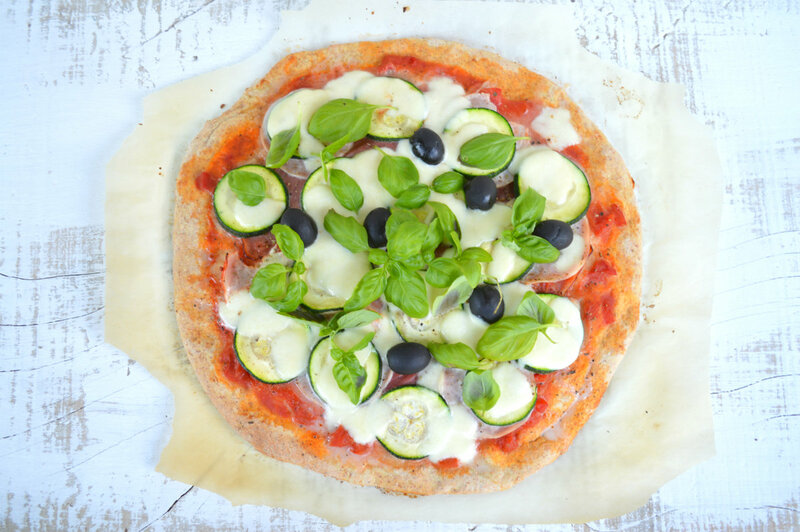 Arrange thinly sliced ​​prosciutto, zucchini and olives. Bake for 10 minutes. Then sprinkle with chopped mozzarella and bake for another 5 minutes. Remove from the oven and sprinkle with fresh basil (instead of basil you can put arugula or some kind of lettuce).